This morning it is grey, damp and my mood is flat. I have the post-holiday blues, that back to reality feeling that won't shift. We've just returned from a fantastic weekend in the Lake District and even the weather was pretty good considering it's the end of October. After staying in Coniston back in April, I really wanted to return to the lakes and explore a little more. This time I booked us a long weekend stay at Scales Plantation , a glamping site based on a working farm and close to both Keswick and Penrith. 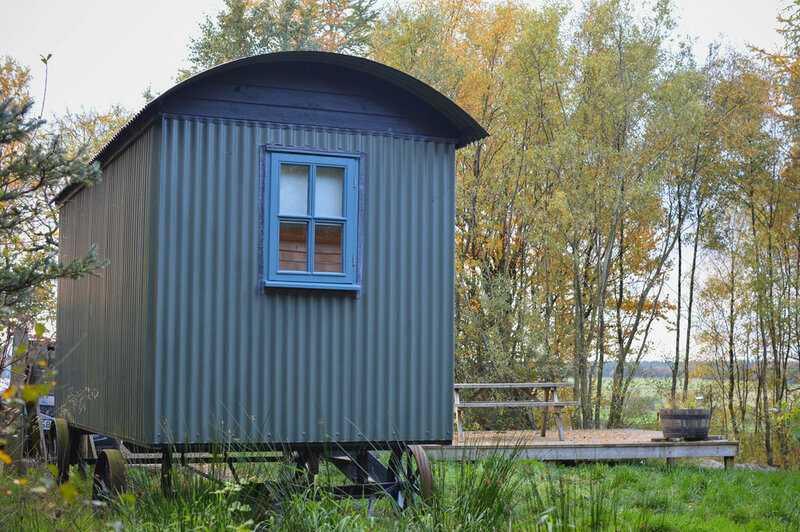 I've always wanted to stay in a Shepherd's Hut, I think they are so beautiful, pretty yet cosy but it seems quite difficult to find one that will fit a family. I'd had my eye on staying at Scales Plantation for a while, I always loved the look of the little individual camps in the woods and the fact that the huts slept four seemed ideal for our family. We chose Blencathra which happened to be right at the end of a track that winds through the woodland. The camp is surrounded by trees, the sunshine peeking through on occasion and lighting up our little kitchen with some golden rays. Outside has a large decked area, garden table, big pots of fresh herbs, a fire-pit and even a little pond for wildlife watching. We didn't do any outside cooking though as it got super dark early (especially after the clocks changed on Sunday). Instead we stayed warm and toasty in the kitchen, which houses a wood burning stove, a hob, fridge, sink, a large table, built in benches and all decorated in an easy going, rustic style. It's like a perfect little cabin in the woods and to the side of the kitchen, is the bathroom, with a bath, shower and blissfully another wood burning stove. I've never been so cosy. Inside the Shepherd's Hut there is a proper double bed with feather down duvet and two bunk beds. And another wood burning stove. I always prepare for chilly nights camping and take a ridiculous amount of stuff with me to wear in bed. This time, I didn't need any of that. I was so warm and comfortable. I'm not sure I can go back to sleeping in tents now after such luxury. Ha! Obviously being off-grid means that there is no wi-fi or no phone signal and I totally embraced that. I read several books - The Winter Ghosts by Kate Mosse, which was excellent, a bit of an old fashioned ghost story. Then I also really enjoyed The Kind Worth Killing by Peter Swanson, an unputdownable crime thriller that had so many twists and turns that at times genuinely took me by surprise. And finally I started the new Sarah Waters, The Paying Guests. Reading by candlelight was the perfect way to spend the evening with a glass of red wine in hand. Although I did think on Saturday night that I would have liked to have been able to watch Strictly! And travelling back Monday I had to avoid newspaper headlines and radio reports as I didn't want to see who'd gone out. (I'm all caught up now for the record). Each morning I got up and lit the stove in the hut, climbed back to bed and read a little more before wandering over to the camp kitchen and having that first cup of coffee of the day. It was so peaceful and it really did feel like you are alone out there, with just the birds singing in the trees for company. Having a camp to yourself is utter bliss and part of me never wanted to leave. We'll definitely be returning there soon.